Hello, all my ribbon loving friends! Today starts a brand new fun challenge at Really Reasonable Ribbon, and this time our theme is SUMMER. This challenge allows you to celebrate summer however you choose. It can be with a summer themed project, summer colors, a card, or anything else that includes ribbon of some kind. We can't wait to see your creativity! 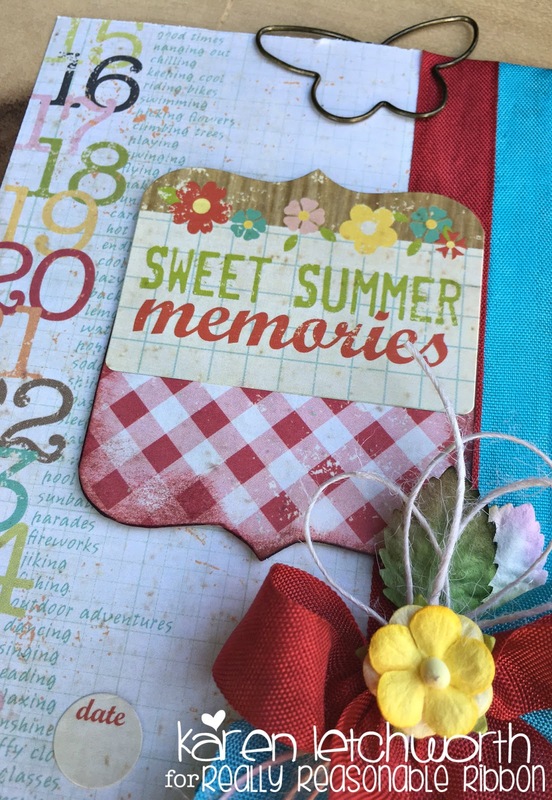 I made a fun Summer card using some older patterned papers and stickers. I ran a length of both Peacock Alley Seam Binding and Lipstick Red Seam Binding down the length of my card, and used each of these again to tie a lovely bow that has some Ivory Burlap String bundled into it as well. I just love how these trims add such bright color to my card as well as depth and texture. There's a Prima butterfly paper clip at the top of my card, and I inked my card and tag with Tim Holtz Barn Door Distress Ink. I really hope you will stop by to play along in this fun new Summer Challenge at Really Reasonable Ribbon, and I thank you again for visiting me today. Have a great week. Deep Ocean Challenge Blog - Challenge #157 - Die-Cuts, Chipboard and Punches - I used a PTI die-cut to make the journalling/sentiment spot. Joy Clair Challenge Blog - June Challenge: Anything Goes - The inspiration photo made me think of SUMMER, so I'm sharing this card. 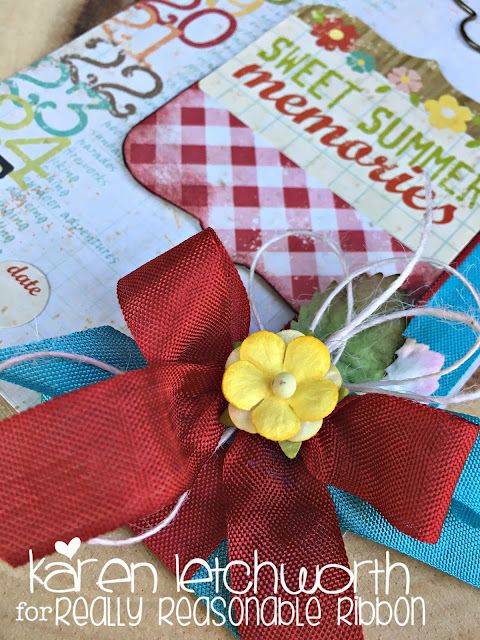 Cut It Up Challenge Blog - Challenge #124 - Picnic - For this fun SUMMER card, I purposely used that red and white gingham paper to resemble a traditional Summer picnic tablecloth. You might also notice that sweet patterned paper that numbers all the fun things you can do in the Summer including PICNICS!! CropStop June Challenge - Anything Goes Linky Party #29 - I used lots of Tombow Adhesive, May Arts Ivory Burlap String, and Tim Holtz Distress Ink. Karen, love the bright colors of your summer card. How gorgeous Karen - love the lemon coloured flower contrasted with the maroon ribbon. It's a beautiful card. I love all the little details like the paper clip and the string. Thanks for sharing with us for our Picnic challenge at Cut it Up! 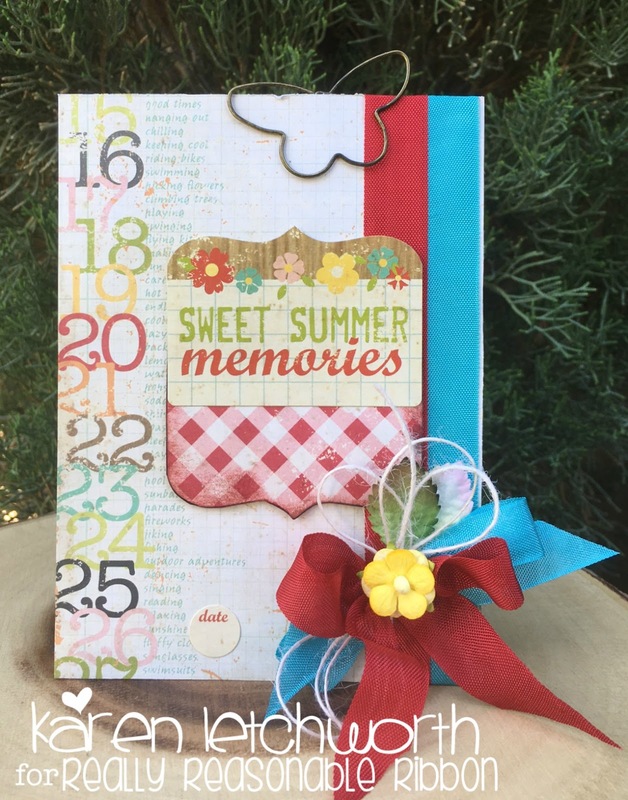 Everything about your lovely card says "summer!" You have an eye for just the right embellishments to use! Thanks for linking this up to Cropstop! I love seeing your name appear in the gallery! Aww! This is so sweet! Love the yellow blossom on the red seam binding. Classic! What a pretty card. I love your colorful mix of patterned papers and your embellishments are beautiful. Summery sweetness. What a gorgeous card!! Love the pretty bow and the paper clip!! Thanks for joining us at Cut it Up challenge! Sweet card! I love all the little details and the summer theme!